Joy Creek Photo Archive (c) all rights reserved (S. callosa x S. cotyledon) Saxifraga x macnabiana is a charming rosette former that is ideal for a rockery or the front of a dry border. 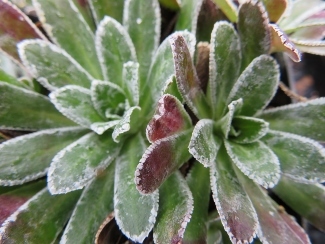 The edges of the leaves are encrusted with tiny, stiff, silver hairs that make them feel hard to the touch. Don't let this get covered over with other plants. Early summer. 2 in. x 6 in.